Kajal is a makeup product that every Indian girl loves! These days girls are not only sticking to using blacks, but are venturing out to try different colors like blue, green, purple etc. Finding a best smudge proof kajal that lasts all day (or at least for half a day) is every woman’s number one task. I have compiled a list of 6 affordable and best quality smudge proof kajal that you can use everyday with the hope that your kajal is not going to smudge! The Bourjois kajal comes in 6 gorgeous colors. The texture is smooth and every time it looks as though it’s been applied fresh. It stays up to 3-4 hours and glides on smoothly. This is the kajal I’m using currently and totally love it! It’s super creamy and in just one stroke gives a pitch black color pay off. If you have watery/sensitive eyes, you could give this one a miss as it tends to have a burning sensation initially for some people (which settles in 10 minutes). This kajal can also be used to achieve smokey eyes as it is easily blendable. This is a great kajal to own as it comes with a ‘smudger tip’ on one end and a sharpener on the other, how convenient is that? The texture is soft, creamy and smooth and can be worn even by contact lens wearers. It stays on for a minimum of 7 hours (unbelievable) with mild fading. This according to me is the best smudge proof kajal. This kajal is a roll on retractable pencil which doesn’t have to be sharpened. I am not a big fan of these as I feel that if by chance I retract a little more than required, the tip tends to crack and break very easily. Also, with such a pencil I am never able to get a crisp tip to apply as a liner on the upper lash line. If you prefer roll-on’s like these, this is a great choice for applying as an eyeliner as it comes in 7 different shades! Since it is metallic in nature, it might trouble women with sensitive eyes. This one is soft and creamy too and if worn as an eyeliner, stays up to 6 hours and if worn as kajal stays up to 4 hours atleast. The Chambor kajal has been there since years and comes in some gorgeous colors like emerald green and purple. This pencil can be worn as kajal and also as eyeliner as it contains some glitter particles in it. I would recommend using it as an eyeliner specifically and below the waterline to create some depth and pop of color rather than as a regular kajal. This is something you can have fun with! These are water resistant and have a staying power of up to 5 hours. This kajal is best known for it’s ‘cool yellow’ packaging. This is a roll-on/twist-up pencil too and glides easily on the waterline. The color can be intensified by going back and forth over the waterline 2 to 3 times. It is smudge proof and stays up to a minimum of 5 hours! Each kajal might behave differently on different people all our eyes are not the same. The best thing to do would be try a kajal at the counter (if possible) and let it stay on for a while until you finish your work at the market or at the mall and finally decide on whether to purchase it or not. This should help on how kajal should be applied on the eyes. Do let me know your experience with these kajal’s in case you try them. Hi, thanks for your article! one of the best and to-the-point I’ve read so far. Which kajal kohl (ideally soft pencil that can be sharpened but doesn’t have to be) brand do you recommend for a medium-dark BROWN colour (so not black)? 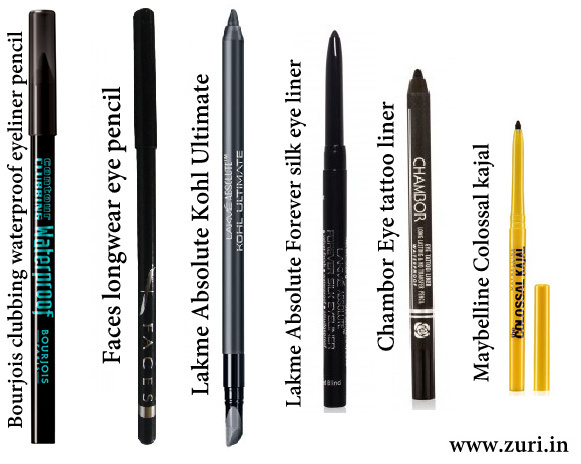 There are many brands that make colored kajal pencils either in roll-on type or the sharpening kind. Try Lakme eyeconic, Colorbar, Inglot, NYX or MAC. They are all wonderful and you can choose a blue, green or brown in it! Thanks for the suggestion! Will surely give it a shot! Faces is a very affordable brand of cosmetics. Am glad you liked it too!